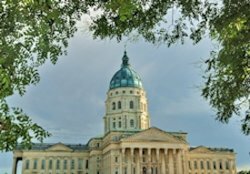 Hawver News Company | … covering Kansas politics, government and more. Celebrating 20 years of Hawver’s Capitol Report! The first edition—a hard-copy newsletter—was published on June 18, 1993. Forty editions were published and snail-mailed each year. In 1999 text-only breaking-news bulletins were e-mailed to subscribers to supplement the hard-copy newsletters. In 2006, HCR became virtually an all e-mailed news service, providing Hawver’s Capitol Report Newsletter (e-mailed usually weekly during the Kansas legislative session and one to four times a month the rest of the year) and Hawver’s Capitol Report Flash (breaking news, daily-type news, etc., e-mailed as warranted). HCR also provides subscribers with the printed/mailed Annual Hawver Kansas Legislative Guide each January (PDFs of the Guide also are provided in e-mailed HCR Newsletters). Upcoming: We are working on an updated website which will have a subscriber’s only section, so the website will morph from being a sales-tool only to also being part of a subscriber’s benefits. The site will include archives of Newsletters and Flashes plus some other cool stuff…stay tuned! A Free Trial Subscription, which we hope will interest you in subscribing to the state’s leading political/state government newsletter. Subscribe ...well, that’s pretty simple, isn’t it. Check out What Subscribers Say—comments from an honor roll of leading Kansans who depend on HCR. About Martin Hawver, well, tells you nearly everything there is worthwhile knowing about Martin Hawver, save for weight, and why his background has made HCR the “must read” of Kansas politics. About Vickie Hawver, well, that tells you about the founder/co-owner/managing partner of Hawver News Company and her role on HCR. What? You didn’t know that Hawver News Company also produces a weekly column that is published by many Kansas newspapers? Well, right below here is the current At The Rail, and links to recent Rail posts are in the column at right. See what you’ve missed, or, if you happen to own a newspaper, see what you can get for your readers (just e-mail us for details on how you can carry the column).